William Clarence Heatley, Gold Coast trawler owner, grazier and businessman, was born in Townsville, Queensland, on 11 July 1920. He was the son of William John Heatley, a businessman and later Mayor of Townsville, and his wife Minnie, née Williams. An Anglican, he was educated at All Souls School in Charters Towers and at Townsville Grammar School. He matriculated from The Southport School on the Gold Coast in February 1938, and immediately commenced an arts degree at the University of Queensland, though he did not sit the examinations at the end of the year. By 1940 he was a tarboy and jackeroo on sheep and cattle properties in the Gulf Country and in the Charters Towers and Cloncurry districts. Heatley enlisted in the AIF on 15 May 1940 at Enoggera, Queensland, and was commissioned lieutenant. He had served as a reservist from 1936, first with the 15th/26th Battalion, then with the 31st Battalion. On Boxing Day 1940, he embarked on the Queen Mary with the 2/15th Battalion, disembarking in February 1941 in the Middle East, where he saw service at Tobruk, in Syria, and at El Alamein. In September 1942 he was wounded in action near El Alamein during operation ‘Bulimba’ in which his battalion suffered heavy casualties. His war wounds troubled him for the rest of his life. From August 1943 until March 1944 he served in New Guinea. Heatley was promoted to captain in October 1942, and mentioned in despatches in March 1945. On 14 March 1944, immediately on his return from New Guinea, he married Barbara Patricia Haynes of Brisbane, the ceremony conducted at the residence of the Catholic Archbishop, James Duhig. Heatley was appointed a senator by the Queensland Parliament on 11 August 1966, under section 15 of the Constitution, to fill the vacancy created by the death of Senator Sherrington, with a term due to expire on the date of the next House of Representatives election, 26 November 1966. To enable him to hold the seat until what would have been the conclusion of Sherrington’s term, it was necessary for Heatley to win a place at that election, which he did. Thus he was able to continue to fill the vacancy until 30 June 1968. Hoping to win a six-year term in his own right, Heatley contested the Senate election held on 25 November 1967 but, holding third place on a joint Liberal–Country Party ticket, he was defeated. Tonight, at exactly this hour, is the anniversary of an occasion 24 years ago when I left a trench to take up the starting line in a battle which was to be the rehearsal for the Battle of Alamein. Fortunately, tonight the opposition is not as strong nor as offensive as it was on that night. As a senator from Queensland, I venture to say that while we must retain our hereditary rights and duties as watch dogs for our respective States we must also consider adopting a federation of views and minds and actions to the benefit of the Commonwealth, particularly in regard to national security and development. Most of what he said after that related to the development of Queensland, north and south, rural industry, grazing, sugar, mining, drought and water conservation, beef cattle roads, investment of foreign capital, taxation, roads, shipping, aviation, education and fisheries. On one occasion he acknowledged that he was a shareholder in the South Sea Fishing Company, though denying the assertions of Senator Keeffe that the company paid below the award rates. His membership of the Select Committee on Off-shore Petroleum Resources represented an attempt to redress what he saw as yet another undervalued development opportunity. He supported the establishment of the Australian Tourist Commission in 1967, because, he said, he lived in Surfers Paradise, one of the largest tourist centres in Australia. 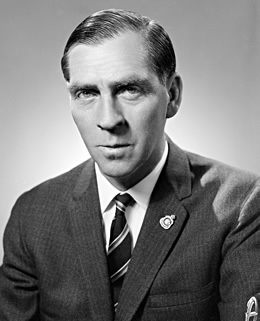 After the conclusion of his Senate term, Heatley turned to state politics and, at a by-election on 14 February 1970, became the MLA for the Gold Coast seat of Albert. Known to some of his fellow Queenslanders as ‘Gentleman Bill’, Heatley was reserved and unassuming in manner. His death, on 29 October 1971, at his Surfers Paradise home, was untimely. He was cremated at Mount Thompson, Brisbane. Heatley’s war service in the Pacific is commemorated by a plaque in Pinnaroo Lawn Cemetery at Bridgeman Downs, Brisbane. Barbara survived him, as did their four children. The Leader of the Opposition in the Senate, Senator Lionel Murphy [q.v. NSW], observed: ‘We regarded him as one who was setting out to do in a sensible fashion all that he could do on behalf of his State of Queensland’. Courier-Mail (Brisb. ), 13 Apr. 1966, p. 1; The editor is indebted to Meagan Lyneham, University Archives, UQ; Heatley, William Clarence—Defence Service Record, B883, QX6231, NAA; Ronald J. Austin, Let Enemies Beware! ‘Caveant Hostes’: The History of the 2/15th Battalion, 1940–1945, The 2/15th Battalion, AIF, Remembrance Club in association with Slouch Hat Publications, McCrae, Vic., 1995, pp. 3, 141–2, 208, 244, 260, 265; Queensland Liberal (Brisb. ), May 1966, p. 1; QPD, 11 Aug. 1966, pp. 148–9; CT, 21 Apr. 1966, p. 2. CPD, 31 Aug. 1966, pp. 224–7, 12 Oct. 1966, pp. 995–7, 20 Sept. 1967, pp. 747–50, 13 June 1968, p. 1795, 19 Apr. 1967, pp. 912–14, 8 Nov. 1967, pp. 2342–4; CT, 9 Nov. 1967, p. 12; CPP, 201/1971; CPD, 29 May 1968, pp. 1243–5, 10 May 1967, pp. 1314–15. QPD, 9 Nov. 1971, pp. 1565–7; Courier-Mail (Brisb. ), 30 Oct. 1971, p. 3; Gold Coast Bulletin, 2 Nov. 1971, p. 2; CPD, 2 Nov. 1971, p. 1590. This biography was first published in The Biographical Dictionary of the Australian Senate, vol. 3, 1962-1983, University of New South Wales Press Ltd, Sydney, 2010, pp. 343-345.